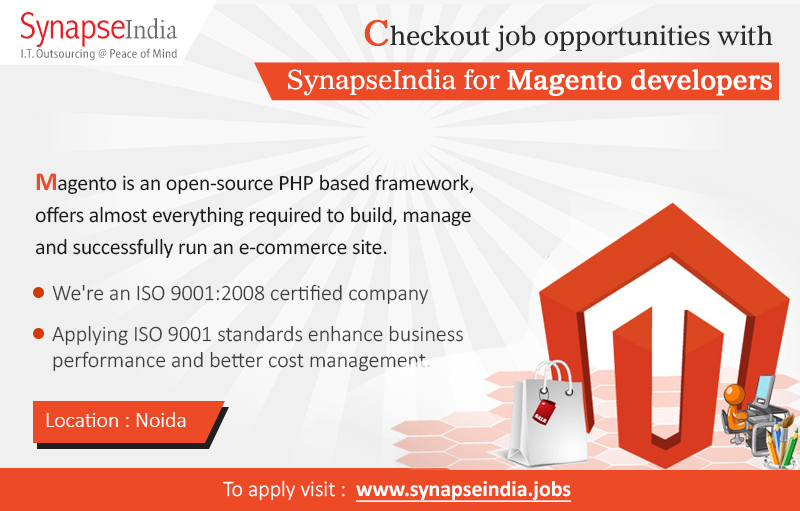 Checkout SynapseIndia jobs opportunities for Magento website developers. Magento is an open-source PHP based framework, offers almost everything required to build, manage and successfully run an e-commerce site. Founded by Shamit Khemka, SynapseIndia is an ISO 9001:2008 certified company. Applying ISO 9001 standards enhance business performance and better cost management. We're widely known for providing our employees with best working conditions & great employee benefits. We have a strong team of web developers having expertise across different technologies & platforms including Magento. Our team of Magento developers has delivered a number of eCommerce projects to clients globally.